Hi, thank you for accepting this interview for the first edition of the FCI Newsletter in 2012. Please, tell us something about you in few words: who are you, how old are you, when did you meet dogs for the first time and what breed do you have at home? My name is Maija Kärki and I am a 16-year old high school student living in the middle of Finland in a city called Kuopio. My mother started to breed toy, dwarf and medium size poodles before I was even born, so all my life I have been connected to dogs and dog shows. For the moment we have black, brown and white poodles which we’re breeding together with my mother. We have also two Yorkshire Terriers and a year ago I got my first Lhasa Apso. In what countries have you competed as a Junior Handler and which were your major awards? I have competed mostly in Finland and other Nordic countries, but also a few times in Estonia and Lithuania. I could say that I have achieved my all-time biggest wins in the last few years. I have won four qualifications to Finnish Championships & also got placed twice in the championship final – # 4 in 2007 and #3 in 2009, I have won four District Championships, I have been part of the Finnish representative team in the Nordic Championship competition and in the 2010 WDS in Denmark I had the honour to compete in the World Championships. Do you have a special feeling about a specific breed which you prefer to handle? What are the breeds you use to show in competitions? Poodles have always been “the thing” for me. I started my career with this breed and all these years I have mostly competed with them. I just love their showy attitude, lovely temperament, elegance and to be honest – they never get tired, which is of course a good thing. In recent years I have also competed quite a lot with Lhasa Apsos and that is a real special breed for me also. I have mostly competed with companion & toy dogs, but also a couple of times with other kinds of breeds. How did you start with that career? How did you learn about it? Do you remember your first experience in the ring? I started my junior handling career eight years ago when I was 9 years old, but my very first time in the ring was in Child&Dog-competition when I was 3. After my first JH-competition I was full of potential because I got a placement in a tough competition and I thought one day I will be as good as my mother. I started to ask advice from older successful junior handlers and breeders and after that I also started to show different breeds which gave me much more to learn. Do you think it’s easy to be a Junior Handling Judge? In my opinion it should be very easy! If the judge really knows what she/he wants from a good handler, I think the decisions should be easy to take. I have judged some unofficial competitions here, and I can say it isn’t hard to find out who is talented and who is not. How is Junior Handling organised in your country? In Finland junior handling is a very famous sport. Competitions are held almost in every show. The support and education for young handlers is very strong, and there are several training lessons held during the whole year. In your opinion what is the most important skill in being a good Junior Handler? I think it must be the right attitude and the way how the person treats dogs. Some people just have the right “connection” with all dogs and that makes showing them much easier. The most important thing is to stay humble! Many times people say that parents are often causes of tensions in the sport. Should parents encourage Junior Handling or leave Juniors to care about that? Tell us about your experience. My own family has always been part of this hobby and I really have to thank them for it. They have always supported me, taken care of all details, been my taxi drivers, and made it possible, thanks to their connections, to show high quality dogs and getting advice from famous handlers and breeders. Do you personally take care of grooming? I could say that most of my free time is dedicated to grooming our dogs! When I was younger I helped my mother take care of the coats and she taught me to groom and trim professionally. I started to learn grooming at the age of 3 and nowadays we are doing it together with my mum and both of us have our own dogs. As well as I take care of our own dogs’ grooming, I also help my Lhasa’s breeder sometimes with her dogs. Did you ever work as an assistant for a professional handler before? No, but I have got opportunities to follow the work of famous professional handlers and to assist them. Are you showing dogs professionally too? Yes I could say so. 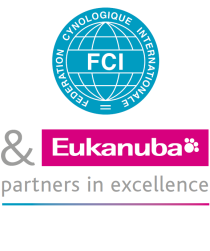 I have shown a lot of different dogs and breeds from all FCI groups and usually my days in shows are full of running from one ring to another. I have some dogs which I am showing regularly and which I have also borrowed from junior handling competitions. This is my eighth and also the last year with this wonderful hobby. I am very pleased with all the great experiences I’ve got with junior handling and I will keep my handler career going when I finally have enough time to show all the dogs I have been asked to show. I hope one day I will also continue the breeding activity of my mother with her strong, healthy and beautiful lines from Equerry’s kennel name. Thank you for this interview Maija, we wish you good luck for your next shows!